Okayyyyy…so, I was writing this post and I was almost done when the page was reloaded without being saved…and I lost the WHOLE post…excuse me while I go into a corner and cry. Well, there’s not much I can do…so here goes attempt #2. I meant to update you all on the cake baking process sooner, but it kind of just slipped my mind until now…so here we go! 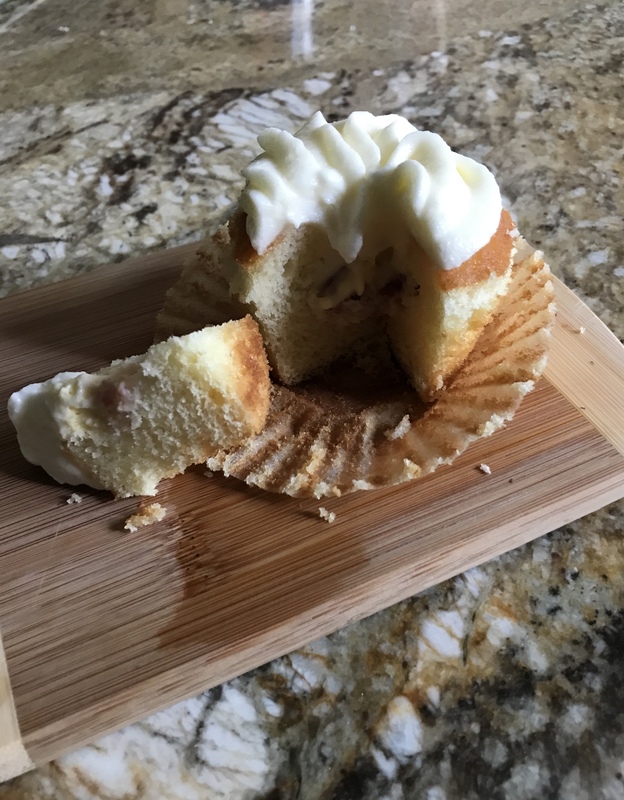 If you read my previous post, you’ll know that I wrote about my opinions of from-scratch vanilla cake recipes and how all my previous experiences with these recipes always came up short. They’d either turn out very dry or dense, and in my opinion boxed vanilla cake mix was much faster with better results. HOWEVER, this recipe has restored my faith in from-scratch baking. It’s moist, the texture is light and fluffy, and the flavor is much better. What’s different about this recipe? It uses sour cream in place of 2% milk (…well I should be baking with whole milk..but I usually don’t have that on hand..bad habit..I know). Sour cream has more fat in it than regular milk which contributes to the moist and tender texture it gives a cake. It’s the same reason why those weird cake recipes that use mayonnaise in them turn out so good. The role of fat in making your cake texture 100x better has to do with gluten. I know there are some cake recipes that require you to mix the dry ingredients with room temperature butter first to make a sand like mixture before adding in the wet ingredients. These recipes include these steps to prevent gluten from forming in the cake. Gluten formation is reduced by the butter (aka the fat) coating the different gluten proteins before they come in contact with the liquids. By coating the proteins, it prevents them from bonding together to form gluten when you add the wet ingredients. To give a little background on gluten, gluten is made up of two classes of proteins: gliadin and glutenin. These two proteins are present in the flour you use to bake. When you add water to these two proteins, they come together to form gluten. Gluten is what makes dough elastic and stretchy and it’s what gives bread it’s structure. But it’s also what makes your cake chewy…and that’s not what you want. The fat in butter is what coats the proteins, and thus the same logic applies to sour cream. The fat content in sour cream helps to prevent gluten formation. In addition, with sour cream, the acidity also influences protein interaction and starch gelation which further improves the texture of the cake. I didn’t have enough ingredients to make another full on cake (and I decided it wouldn’t be an effective use of time) so I used this cake recipe to test out how I was going to make the cupcakes. I cored the middle and added in fresh strawberries and cream cheese pastry cream. The only problem I had, was that I overfilled the cupcake moulds. 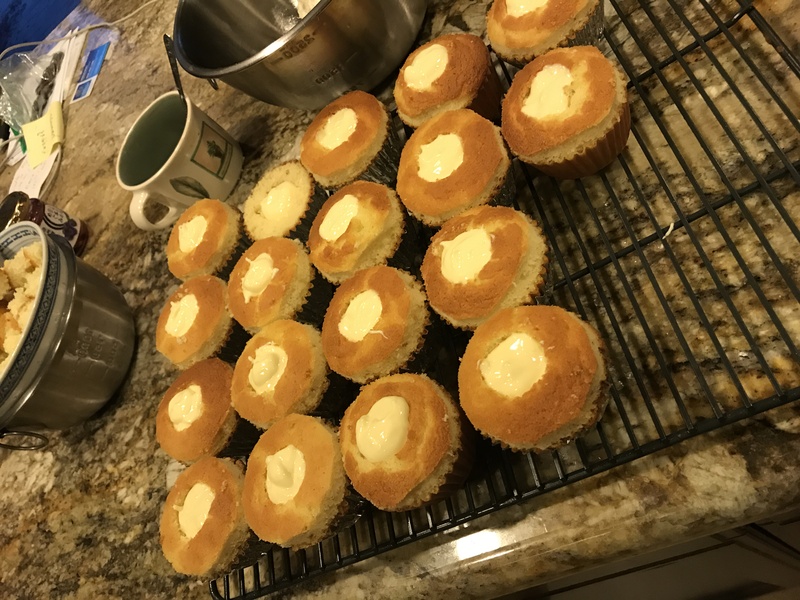 For cupcakes, I don’t want the cakes to rise over the edge because it increases the surface area that you need to frost (meaning more use of buttercream…what a waste 🙁 ). That is why all the cupcakes pictured are oddly trimmed at the sides…ah the perfectionist inside me cringes…don’t worry Hannah I won’t do this for your wedding 😉 . For the buttercream on top, I tried to make a cream cheese Italian meringue buttercream…but it turned out horribly soft and flimsy (definitely not suitable for cake decorating). The taste was great, and it was fine to put on the cupcakes, but it would just slide off the sides if I tried to put it on the cakes…soo we’re sticking with the original Italian buttercream recipe for the wedding. ThePuffaron is the result of a passion that I could never really leave behind no matter what people told me about practicality. It is the cumulation of what I love to do, and I hope you can enjoy a bit of this journey I'm on!